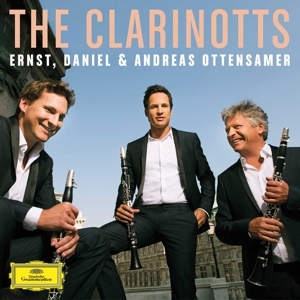 The Clarinotts are a one-of-a-kind clarinet trio formed of Ernst, Daniel and Andreas Ottensamer – the Principal Clarinettists of the Vienna Philharmonic and Berlin Philharmonic Orchestras. Founded in 2005, the ensemble aims to find new and exciting ways in which to bring the varied voices of the clarinet family to the fore, performing on the E-flat, bass clarinet and basset horn alongside the more common B-flat and A clarinet. With an emphasis on the Viennese tradition of clarinet playing, the individual excellence of each player – all esteemed international soloists in their own right – is expressed in collective performances of the very highest quality. Comprising extant works, new arrangements and high-profile commissions, The Clarinotts’ repertoire is wide-ranging and diverse, covering core classical masterpieces as well as film music and jazz – all serving to display the dazzling range of colour and inbuilt unity of this critically acclaimed father-and-son trio. The ensemble ranges accordingly, performing duos and trios with and without piano, as well as in combination with other artists and ensembles. The Clarinotts regularly tour Europe and Asia, and appear as guests with many of the world’s most renowned orchestras and festivals. Recent and upcoming highlights include tours of Japan, China and Taiwan, and the world première of a triple clarinet concerto by celebrated Austro-Hungarian composer Ivàn Eröd with the Vienna Philharmonic Orchestra under Andris Nelsons (January 2016). The Clarinotts released their debut album on Octavia Records and Gramola Vienna in 2009 to much critical acclaim, and are set to release a recording on Mercury Classics/Deutsche Grammophon in early 2016.